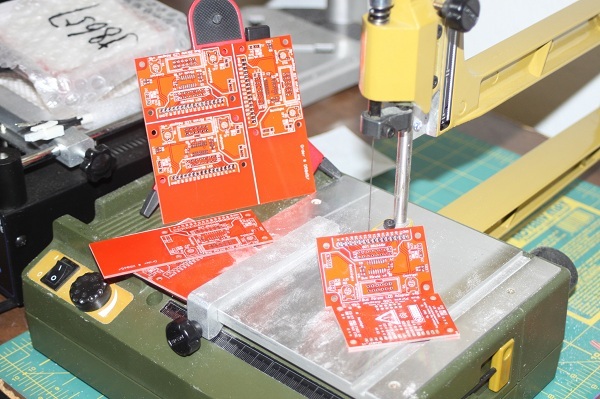 Want to get more out of the cheap PCB services? This is just what Systemstech did when he ordered Bus Pirate LCD adapter v4 to be made. He was able to fit 3 boards on a single 10cmx10xm PCB. All that was left was for him to cut out the board with a scroll saw. Grab the Bus Pirate LCD adapter v3 for $9.00 at Seeed. This entry was posted on Wednesday, October 31st, 2012 at 1:00 pm	and is filed under BP v4, DIY. You can follow any responses to this entry through the RSS 2.0 feed. You can skip to the end and leave a response. Pinging is currently not allowed. I’m not sure how this got posted, or how it has gone without comment for nearly a day now. Glass composites will destroy non-carbide saw blades almost instantly in addition to creating lots of toxic dust. If you want to use a saw to cut fiberglass, you really want to be using a diamond cutting wet saw. You can get small tile-cutting saws (and blades) fairly cheap for straight cuts and diamond bandsaws (intended for lapidary use) for cutting curves. Thanks for you suggestion it works great. I had to lookup the definition of “lapidary”. So for those who don’t know what it is….